WATERSTONES ARNDALE CENTRE MANCHESTER, 15th December 2012. Sam Stone and David Howe will be revisiting this super store in Manchester town centre. Sam's new Vampire Gene Book Silent Sand will be available as well as her new Steampunk/Horror Novella, Zombies At Tiffany's. David's horror collection talespinning will also be available. David J Howe, Sam Stone and Frazer Hines are among the many esteemed guests attending this year's convention to celebrate the 50th Anniversary of Doctor Who. Address: Marriott Los Angeles Airport Hotel, 5855 West Century Boulevard, Los Angeles, USA. 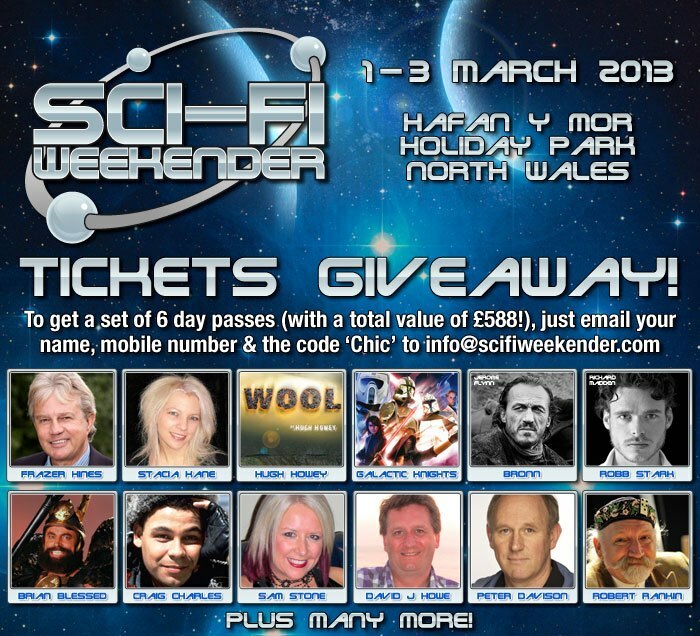 SCI-FI WEEKENDER, Pwllheli, North Wales, 1-3 March 2013. Sam Stone and David J Howe will be joining the line-up of media and writing guests at this huge event taking place in North Wales. The weekend offers a range of panels, interviews, signings and opportunities to meet your favourite actors and writers currently working within the genre of Science Fiction, Fantasy and Horror. Sam and David will be taking part in panels, interviews and will be available to sign their books. For further information visit SCI-FI WEEKENDER. Address: Hafan y Mor Holiday Park, Pwllheli, Gwynedd, North Wales, LL53 6HX. WALES COMIC CON, Wrexham, North Wales, 28th April 2013. Sam and David are happy to be invited back to this wonderful event. They will be available for signings, photographs and copies of all books will be available to purchase at the event. Date: Sunday 28th April 2013. There are still some tickets left to win for the SCI-FI WEEKENDER. ALMOST all other tickets are predicted to be sold out by mid-December, so if you would like to win tickets to the event then here are the details to enter. WATERSTONES KETTERING, Sat 17th November, 2012. Sam Stone and David J Howe to visit Kettering Waterstones for the first time with their new books. Date: Sat 29th Sept 2012. Sam Stone and David J Howe are happy to be returning to Liverpool One Waterstones this year with their new books. Address: Waterstones, Liverpool One, 12 College Lane, Liverpool, L1 3DL. Date: Sat 10th November 2012. Sam Stone and David J Howe will be joining the line up of celebrity and media guests at this event. Time: This is an all weekend event - Due to other commitments Sam and David will only be attending on Sunday.